Thinking about whitening your teeth? You’re not alone. According to Statistica, in 2017 over 39 million Americans used some type of teeth whitener to achieve a brighter smile. But not all teeth whitening methods are created equal. Let’s take a look at a couple of the most common over-the-counter teeth whitening methods and introduce you to one of our personal favorites – the Philips Zoom Whitening System. Tooth Whitening Toothpaste: Whitening toothpaste contains a higher concentration of hydrogen peroxide than typical toothpaste. It is the cheapest method for brightening your teeth but results can take months to appear and aren’t typically dramatic since whitening toothpaste only has the ability to remove on the surface staining. Tooth Whitening Strips: Various companies offer over-the counter-teeth whitening strips. While these strips that you place on your teeth come in various strengths for varying results, once again, these products only remove some surface stains and cost substantially more than a tube of whitening toothpaste. Some internal tooth whitening can take place with the OTC strips, but the chemistry isn’t as stable as most of the professional whitening systems and unfortunately, there is no way to know how long the products have been sitting on the shelf, which decreases their effectiveness. Additionally, over-the-counter whitening strips are notorious for causing tooth sensitivity as well as irritating gum tissue. 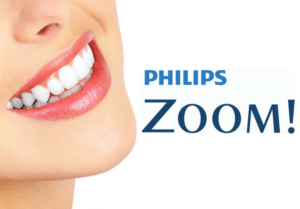 The Philips Zoom Whitening System! 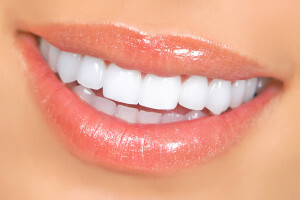 At Eggert Family Dentistry, we offer a variety of teeth whitening and bleaching options including professional strips and whitening trays that are gentler on your teeth and gums and are more effective at introducing the whiting product into the internal area of the tooth.. However, one of our easiest and most effective teeth whitening products – Zoom Whitening – is fast and the results are brilliant. It is performed in a single, two hour appointment and lightens teeth anywhere from 4-10 shades! With a Zoom treatment, we apply a professional tooth whitening gel to your teeth followed by an LED light to activate the gel and help the gel penetrate into the tooth. This is performed in four 15-minute increments and includes a post-treatment consult where we discuss at home follow-up care. Follow-up care may include whitening trays and sensitivity management. We are excited to offer to the first 20 patients to contact us through our new and improved website, the chance to experience the Zoom Whitening system for HALF OFF at only $300 (normally a $600 value). Hurry! This offer expires June 30, 2018. Just in time for grads and dads!! If you’re interested in whitening your smile and would like to discuss Zoom Whitening or any of our other whitening solutions, you can give us a call at (651) 482-8412 or contact us online. We would love to schedule a consult and help you decide which whitening option is right for you!